For the Polish village, see Łumpia. Lumpia is a spring roll originating from China which is commonly found in Indonesia and the Philippines. It is a savoury snack made of thin crepe pastry skin called "lumpia wrapper" enveloping a mixture of savoury fillings, consists of chopped vegetables (carrots, cabbages, green beans, bamboo shoots and leeks) or sometimes also minced meat (chicken, shrimp, pork or beef). It is often served as an appetizer or snack, and might be served deep fried or fresh (unfried). Lumpia is quite similar to fresh popiah or fried spring rolls popular in Southeast Asia. In Indonesia lumpia has become a favorite snack, and is known as a street hawker food in the country. In the Philippines lumpia is one of the most common dishes found in any kind of gathering celebration. In the Netherlands and Belgium, it is spelled loempia, which is the old Indonesian spelling for lumpia, and has also become the generic name for "spring roll" in Dutch. A variant is the Vietnamese lumpia, wrapped in a thinner pastry, though still close in size to a spring roll, in which the wrapping closes the ends off completely, which is typical for lumpia. The term lumpia derives from Hokkien lunpia (Chinese: 潤餅; pinyin: rùnbǐng; Pe̍h-ōe-jī: jūn-piáⁿ, lūn-piáⁿ), which is an alternate term for popiah. Spring rolls of different shapes, sizes and fillings have been a popular snack in East Asia and Southeast Asia for centuries. It is believed that the spring rolls are originated from China. It was a seasonal food consumed during the spring, started as a pancake filled with the new season's spring vegetables, a welcome change from the preserved foods of the long winter months. The recipes, both fried and fresh versions, were brought by Chinese immigrants from the Fujian province of China to Southeast Asia and became popular when they settled in Indonesia and the Philippines. Filipino lumpia wrapper (a thin egg crêpe) is characteristically thinner than other spring roll variants. It is traditionally made with egg, flour, and water with a bit of salt mixed into a wet dough. It is left to stand for a few hours before cooking. A ball of dough is taken with one hand and smeared into a heated large flat metal plate greased with oil until a very thin circular film of it adheres to the pan and fries. It is cooked for a few seconds then quickly taken out and left to dry. In modern mass production, Filipino lumpia wrappers are generally made by automated assembly-line machines similar to those used to make spring roll wrappers, differing only in the recipe and the thickness of the wrapper. It uses a revolving drum. Chinese influence is evident in Indonesian cuisine, such as bakmi, mie ayam, pangsit, mie goreng, kwetiau goreng, nasi goreng, bakso, and lumpia. Throughout the country, spring rolls are generally called lumpia, however, sometimes an old Chinese Indonesian spelling is used; spelled as loen pia. In Indonesia lumpia is associated with Chinese Indonesian cuisine and commonly found in cities where significant Chinese Indonesian settles. Although some local variants exist and the filling ingredients may vary, the most popular variant is Lumpia Semarang, available in fried or unfried variants. Unlike its Philippines counterpart, Indonesian lumpia is rarely using minced pork as fillings. This was meant to cater for larger Muslim clientele, thus popular fillings are usually chicken, shrimp, egg and vegetables. Indonesian lumpia is commonly filled with seasoned chopped rebung (bamboo shoots) with minced chicken or prawns, served with fresh baby shallots or leeks in sweet tauco (fermented soy) based sauce. Other than homemade, lumpia is also offered as street food sold by travelling vendor on carts, sold in foodstalls specializing on Lumpia Semarang, or sold in traditional marketplaces as part of kue (Indonesian traditional snack) or jajan pasar (market munchies). Simpler and cheaper lumpia is sold as part of gorengan (Indonesian fritters). Indonesians also noted for their fondness of hot and spicy food, therefore spicy hot sambal chili sauce or fresh bird's eye chili are usually added as dipping sauce or condiment. Named after the capital city of Central Java in Indonesia, Semarang, where significant Chinese Indonesian settles, lumpia Semarang is perhaps the most popular lumpia variant in Indonesia. It has become associated with the city, and the spring rolls are often sought by the visitors in Semarang as food gift or souvenir. Originally made by Chinese immigrants, this lumpia is filled with bamboo shoots, dried shrimp, chicken, and/or prawns. It is served with a sweet chili sauce made from dried shrimp (optional), coconut sugar, red chili peppers, bird's eye chili peppers, ground white pepper, tapioca starch, water, and baby shallots. Lumpia Semarang is served either deep-fried or unfried, as the filling is already cooked. Named after the city of Surabaya in East Java, where this lumpia was originally made. It is made of mostly the same ingredients of lumpia semarang, but much less sweet in taste. Smaller size deep fried lumpia sold as snack in Purwokerto Train Station, Central Java. Lumpia goreng is a simple fried spring rolls filled with vegetables; the spring roll wrappers are filled with chopped carrots cut into matchstick size, shredded cabbage, and sometimes mushrooms. Although usually filled only with vegetables, the fried spring rolls might be enrichen with minced beef, chicken, or prawns. There is also a common, cheap and simple variant of fried lumpia, eaten not as a single dish but as part of assorted gorengan (Indonesian fritters) snack, sold together with fried battered tempeh, tofu, oncom, sweet potato and cassava. The filling is simple and modest, only filled with bihun (rice vermicelli) with chopped carrots and cabbages. Usually eaten with fresh bird's eye chili pepper. The sliced lumpia goreng is also the ingredient of soto mie (noodle soto). Lumpia basah (fresh, unfried lumpia). It literally means "wet spring roll", or often translated as "fresh spring roll" which means spring roll without frying. It is similar to the Vietnamese spring roll with bean sprouts, carrots, shrimp and/or chicken, and served with sweet tauco (another Hokkien word for salted soybeans) sauce. Popular appetizer in Indonesia, chicken lumpia, with fillings including shredded chicken, sliced carrot, onion and garlic, seasoned with sugar, salt and pepper. In Yogyakarta, there is a popular chicken lumpia variant called Lumpia Mutiara, sold in front of Mutiara Hotel in Malioboro street. Vegetarian lumpia, usually filled with glass noodles, shredded cabbage, lettuce, julienned carrots, minced garlic and celery, seasoned with soy sauce and sweet chili sauce. Bite size smaller lumpia snack, the skin pastry crepes is the same with common lumpia; however it is filled only with abon (beef floss) or ebi (dried prawn floss). The much smaller and drier lumpia with similar beef or prawn floss filling is called sumpia, its diameter is about the same as human finger. Lumpia were introduced to the Philippines by early Hokkien immigrants and traders from Fujian since at least the 7th century CE. They have been thoroughly nativized to Philippine cuisine over the centuries and are found throughout the islands. They use various fillings inspired by local ingredients and dishes, and the later cuisines of Spain, China, and the United States. Filipino lumpia can be differentiated from other Asian spring roll versions in that they use a paper-thin pastry-like egg crêpe wrapper. They were also traditionally slender and long, with a shape roughly similar to that of cigars or cigarillos, though modern versions can come in various shapes and sizes. The thinness of the crêpe and the shape of the lumpia give them a relatively denser wrapping that nevertheless remain flaky and light in texture. They are also traditionally dipped in vinegar-based sauces, banana ketchup, or sweet chili sauce. Fresh lumpia, however, typically have wrappers closer in texture to the original Chinese versions and were traditionally made with rice flour which makes them chewier. Various kinds of lumpia, fried or fresh, are ubiquitous in Filipino celebrations. Filipino lumpia also have a unique and extremely popular dessert subcategory, the turon. These are lumpia variants either cooked with a glazing of caramelized sugar; or served with a sprinkling of sugar and/or drowned in latik (coconut caramel), syrup, or honey. Turon are traditionally filled with ripe saba bananas and jackfruit; but they can also use a wide variety of other sweet fillings, from sweet potato to ube. Dinamita or "dynamite lumpia" is a deep-fried stuffed whole chili pepper wrapped in a thin egg crêpe. The stuffing is usually giniling (ground beef or pork), cheese, and spices, but it can also be adapted to use a wide variety of other ingredients, including tocino, ham, bacon, and shredded chicken. It is commonly eaten as an appetizer or as a companion to beer. A version of lumpia with filled with shredded meat cooked adobo style. Lumpiang gulay ("vegetable spring roll"), a version of lumpia usually consisting of various chopped vegetables and a small amount of pork or shrimp. The types of vegetables used can vary greatly, even including rare ingredients in lumpia like tomatoes. It is a fried version. It is not a vegetarian dish by default, but vegan and vegetarian versions can be made from the basic recipe. Lumpiang hubad ("naked spring roll") is lumpiang sariwa (fresh lumpia) served without the crêpe wrapping. Essentially this is not anymore a lumpia but is an alternative way of eating the fresh lumpia's traditional fillings. Lumpiang isda ("fish lumpia) is filled primarily with fish flakes and fried. It is also known as lumpiang galunggong (blackfin scad), lumpiang bangus (milkfish), lumpiang tulingan (yellowfin tuna), etc., depending on the type of fish used. A common version of this combines fish flakes with malunggay (moringa) leaves. Lumpiang keso, more commonly known as "cheese lumpia" or "cheese sticks", is deep-fried lumpia with a slice of cheese (usually cheddar) as filling. Usually served with a dipping sauce made of a mixture of banana ketchup and mayonnaise. Lumpiang labong is similar to lumpiang ubod, but is made with labong (bamboo shoots), rather than heart of palm. It can be eaten fresh or fried. Lumpiang prito ("fried spring roll"), is the generic name for a subclass of lumpia served fried. It usually refers to lumpiang gulay or lumpiang togue. They can come in sizes as small as lumpiang shanghai or as big as lumpiang sariwa. It is usually eaten with vinegar and chili peppers, or a mixture of soy sauce and calamansi juice known as toyomansi. Lumpiang sariwa (Tagalog: "fresh spring roll") or "fresh lumpia", consists of minced minced vegetables and/or various pre-cooked meat or seafood and jicama (singkamas) as an extender, encased in a double wrapping of lettuce leaf and a yellowish egg crêpe. Egg is often used to hold the wrap together. The accompanying sauce is made from chicken or pork stock, a starch mixture, crushed roasted peanuts and fresh garlic. This variety is not fried and is usually around 5 centimetres in diameter and 15 centimetres in length. It is derived from the original Chinese popiah. Lumpiang Shanghai is regarded as the most basic type of lumpia and is one of the most commonly served dishes in Filipino gatherings. It is characteristically filled with sautéed ground pork, minced onion, carrots, and spices with the mixture sometimes held together by beaten egg. They have numerous variants that contain other ingredients like green peas, kinchay (Chinese parsley) or raisins. Lumpiang Shanghai is commonly served with sweet and sour sauce, but ketchup (tomato or banana) and vinegar are popular alternatives. This variant is typically smaller than other lumpia. Despite the name, it does not originate from Shanghai or China. Lumpiang singkamas is similar to lumpiang ubod, but it is made primarily with julienned strips of singkamas (jicama) rather than heart of palm. It can be eaten fresh or fried. A version of lumpiang gulay that is filled primarily with bean sprouts (togue) and various other vegetables such as string beans and carrots. Small morsels of meat, seafood or tofu may be added. Though it is the least expensive of the variants, the preparation the cutting of vegetables and meats into small pieces and pre-cooking these may prove taxing and labour-intensive. It is a fried version. Lumpiang ubod are another variation which are made from julienned ubod (heart of the coconut tree) as the main ingredients. They can be fried or served as lumpiang sariwa. They originated from Silay, Negros Occidental, where a variant, lumpiang Silay, is still popular. Turon, sometimes referred to as lumpiang saging ("banana lumpia), is a sweet, deep-fried spring roll made from saba bananas and may be eaten as a snack or dessert. It also has its own subtypes, including manggang turon (mango), kamote turon (sweet potato), chocolate turon, and ube turon or turon halaya (mashed purple yam). In the Netherlands, lumpia is called loempia which was an old Indonesian spelling for lumpia. It was introduced to the Netherlands through its colonial links with Indonesia. In the Netherlands, loempia is described as a large Indonesian version of Chinese spring rolls, stuffed with minced meat, bean sprouts, and cabbage leaves, and flavoured with soy sauce, garlic and green onion. Loempia is one of the popular snacks sold in Dutch snack bar or eetcafe. Lumpia have such enduring popularity that one can see at least one variant in almost any set of Filipino or Indonesian festivities. 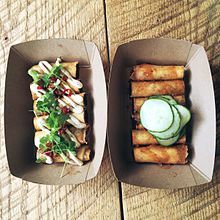 Despite its Chinese origin, in United States lumpia is associated with Filipino cuisine, while in Europe, especially in the Netherlands, lumpia is associated with Indonesian cuisine, owed to their shared colonial links. The distinct taste and ease of preparation (the Shanghai variant at least) have caused Lumpia to be one of the staple food products on the menus of many Filipino restaurants in the United States. ^ Tony Tan. "Indonesian spring rolls (Lumpia)". Gourmet Traveller Australia. Retrieved 25 February 2016. ^ Foodspotting (18 March 2014). The Foodspotting Field Guide. Chronicle Books LLC. p. 46. ISBN 978-1-4521-3008-8. ^ Amy Besa; Romy Dorotan (2014). Memories of Philippine Kitchens. Abrams. ISBN 9781613128084. ^ a b c Koene, Ada Henne (2006). Food Shopper's Guide to Holland. Eburon Uitgeverij B.V. ISBN 9789059720923. ^ a b Nasution, Pepy (February 18, 2010). "Lumpia Semarang Recipe (Semarang Style Springroll)". Indonesia Eats. Retrieved 16 February 2016. ^ Abby. "Lumpiang Shanghai (Filipino Spring Rolls)". Manila Spoon. ^ a b Sri Owen (2014). Sri Owen's Indonesian Food. Pavilion Books. ISBN 9781909815476. Retrieved 16 February 2016. ^ "Lumpia Wrapper (Spring Roll Wrapper)". Steemit. Retrieved 24 December 2018. ^ "Marketman's Quest For The Thinnest Lumpia Wrappers…". Market Manila. Retrieved 24 December 2018. ^ "Filipino Spring Rolls Special Made From Jollibee". Ready-Market Online. Anko Food Machine Co., Ltd. Retrieved 24 December 2018. ^ Heinz Von Holzen (2014). A New Approach to Indonesian Cooking. Marshall Cavendish International Asia Pte Ltd. p. 15. ISBN 9789814634953. Retrieved 16 February 2016. ^ Snack Box (in Indonesian). PT Gramedia Pustaka Utama. p. 33. ISBN 9789792245325. Retrieved 16 February 2016. ^ Yuen, Dina (2013). Indonesian Cooking: Satays, Sambals and More. Tuttle Publishing. ISBN 9781462908530. Retrieved 16 February 2016. ^ "Lumpia Ayam". Tasty Indonesian food. ^ Christina Andhika Setyanti (11 April 2016). "'Lumpia Mutiara' Lumpia Legendaris dari Malioboro". CNN Indonesia (in Indonesian). ^ "Lumpia Sayur (Vegetarian Spring Rolls or Egg Rolls)". Indonesian Cooking 101. ^ Yuyun A. (2010). 38 Inspirasi Usaha Makanan Minuman untuk Home Industry Modal di Bawah 5 Juta (in Indonesian). AgroMedia. ISBN 9789790062719. Retrieved 16 February 2016. ^ "Filipino lumpia gets an American flair". American Food Roots. Retrieved 30 December 2018. ^ Lancero, Aeron. "My Favorite LUMPIA". Via Times News Magazine. Retrieved 30 December 2018. ^ "Filipino Lumpia Recipe". Chef Pablo's. Retrieved 30 December 2018. ^ Dwyer, A.E. "Everything you need to know about Asian egg rolls". The Takeout. Retrieved 30 December 2018. ^ a b Santanachote, Perry. "Beyond Egg Rolls: 9 Spring Rolls Everyone Should Know About". Thrillist. Retrieved 30 December 2018. ^ "Turon (Filipino Fried Banana Rolls)". The Little Epicurean. Retrieved 30 December 2018. ^ Polistico, Edgie. "Barako finger (dynamite chili stick)". Philippine Food Illustrated. Retrieved 22 December 2018. ^ "Dinamita (Dynamite Spring Rolls)". Pinoy Kusinero. Retrieved 22 December 2018. ^ a b c "Love Lumpia? These Lumpia Recipes Are All You Need". Yummy.ph. Retrieved 8 January 2019. ^ Merano, Vanjo. "Lumpiang Gulay (Vegetable Egg Roll Recipe)". Panlasang Pinoy. Retrieved 8 January 2019. ^ "Filipino Lumpia recipe - the vegetarian version of the original ghetto meat filled spring roll". vegetarian yums. Retrieved 13 January 2019. ^ "Fish Lumpia (Tulingan) with Malunggay". Yummy Recipes. Retrieved 8 January 2019. ^ "Lumpiang Isda (Fish Spring Roll) Recipe". FilipinoFoodRecipes.org. Retrieved 8 January 2019. ^ "RECIPE: Lumpiang bangus with singkamas". ABS-CBN News. Retrieved 8 January 2019. ^ "Lumpiang Galunggong". Kawaling Pinoy. Retrieved 8 January 2019. ^ "Filipino Cheese Sticks". The Not So Creative Cook. Retrieved 24 December 2018. ^ Veneracion, Connie. "Lumpiang labong (bamboo shoots spring rolls)". Casa Veneracion. Retrieved 8 January 2019. ^ "Lumpia-Stuffed Wrappers (Lumpia Labong)". Genius Kitchen. Retrieved 8 January 2019. ^ Gapultos, Marvin (2013). The Adobo Road Cookbook: A Filipino Food Journey. Tuttle Publishing. ISBN 9781462911691. ^ Besa, Amy; Dorotan, Romy (2014). Memories of Philippine Kitchens. Abrams. ISBN 9781613128084. ^ "Lumpiang Shanghai (Filipino Spring Rolls)". Manila Spoon. Retrieved 24 December 2018. ^ "Lumpiang Singkamas Recipe". PinoyRecipe.net. Retrieved 8 January 2019. ^ "Lumpiang Togue (Bean Sprout Spring Rolls) Recipe". FilipinoFoodRecipes.org. Retrieved 8 January 2019. ^ "Kamote Turon – Lumpiang Kamote (Sweet Potato Roll) Recipe". Savvy Nana's. Retrieved 8 January 2019. ^ Savage, Emilou. "Ube Halaya Lumpia (Filipino Purple Yam Dessert Spring Rolls)". Colorado Springs Independent. Retrieved 8 January 2019. ^ Carey Jones (14 March 2016). "9 Filipino Dishes You Need to Know". Zagat. Google Inc. Retrieved 18 May 2017. Paolo Espanola (14 October 2016). "How To Navigate A Filipino Restaurant Menu". Thrillist. Group Nine Media Inc. Retrieved 18 May 2017. Wikimedia Commons has media related to Lumpia. This page was last edited on 24 March 2019, at 07:32 (UTC).